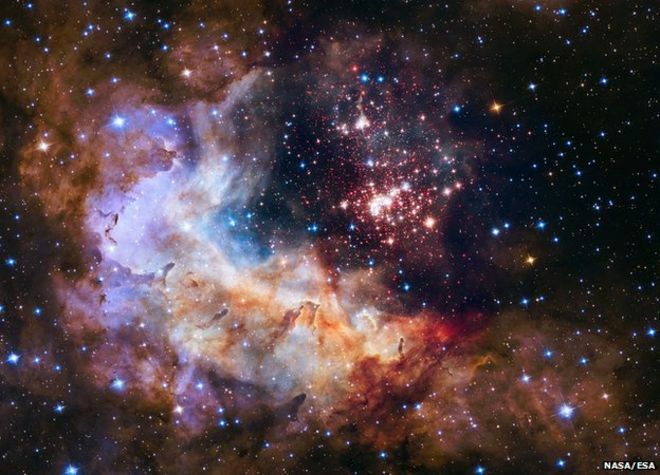 The Hubble Space Telescope has celebrated its silver anniversary with a picture featuring a spectacular vista of young stars blazing across a dense cloud of gas and dust. The "Westerlund 2" cluster of stars is located about 20,000 light-years away in the constellation Carina. some amazing pictures have come from hubble over the last 25 years. shame they are essentially fakes as the colours by and large are false. @Flap Zappa wrote: some amazing pictures have come from hubble over the last 25 years. shame they are essentially fakes as the colours by and large are false. You just had to put a downer on it. Now you can see what years of snivelling for the "nasty party" has done to you!